I know I've posted two of those before, but they're so pretty they're worth posting again. Can't get over how much I love these Revlon glitters. I almost passed them up completely because they looked so plain and common, but now I'm super happy I decided to get them. They're unique in my eyes- while the concept isn't unique, the end result is like nothing else I have. The combination of the different colors and shapes of glitter enhanced by a really pronounced sparkle makes me super happy. The only thing I don't like about these is that it's hard to get enough of the holographic silver hexagon glitter in the nail... I love that stuff. Though, the randomly placed and spaced dispersion of the hex glitter does look rather charming. I like that the glitter is really sparse so it doesn't cover up the base polish. These were intended to be layering polishes and they're sold with coordinating creme polishes but they all looked clone-able so I didn't get any of those. I haven't photographed Belle yet. In fact, I don't think I've even worn Belle. Have I? I don't recall! I like how you combined them, i have Galaxy and Star but i want Slipper since i see its looks great! Thx. :) I've picked up these polishes a bunch of times but I never get them. I really like these though! I finally might get them haha. They're beautiful - they remind me of those pictures of the cosmos! I love these. Why can't we have them in the UK???? Boo. Hiss. OMG I was such a StreetWear fan! They look so amazing! it reminds me of space! I haven't used mine yet. I didn't pick up the silver one because I am sure I have something similar at home. I love the effects you created! I am in LOVE with Revlon Galaxy over Borghese Mezzanotte Blue! SO BEAUTIFUL! They seem to look nice.. but the thing is with Revlon polishes is that they, to my opinion, don't dry as quick as they say. I really like the first & last combo! Looks perfect for the cold weather! I seen these the other day and actually passed on them aswell because they seemed kind of plain and boring and kind of childish (?) if that makes sense. But these swatches look beautiful! I have these as well. Love them to death! I'm so happy I snagged up a couple of these. You gave me some solid ideas on how to pair them up. Cool! I'm so glad I bought these also. They're amazing over so many polishes. Please Revlon bring back StreetWear. These are breathtakingly gorgeous. I am... wow. Absolutely WOW! GORGEOUS! These are gorgeous! I keep seeing swatches of these, thinking I want them, seeing them in the store, and putting them down...not sure why. 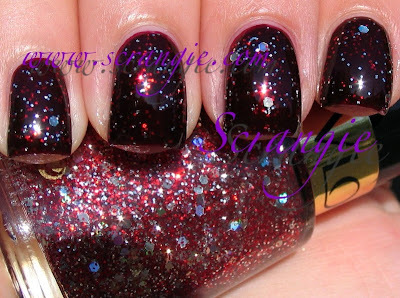 Lovely im just wearing a top coat that has mini stars over my Rock Star Groupie.